Promoter’s organizations of the project want to continue to be present in the urban structure supporting as well the cultural activities of relief; creating synergies between communities in order to obtain the necessary facilities for the realisation of some projects – including the most important and interesting ones, which turns out to be the restoration copy of the Donatello’s Marzocco statue. It is placed on a pedestal of a marble colour on the tribune of Palazzo Vecchio, found in Piazza della Signoria (Signoria Square) in Florence. 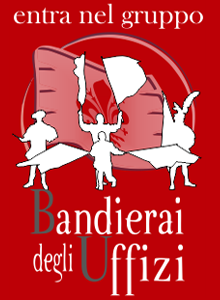 Bandierai degli Uffizi historical group which is supported by the related association denominated Amici dei Bandierai degli Uffizi, organises every year with the contribute and the sponsorship of Florence Council one of the official events of the Florentine popolar tradition “Trofeo Marzocco” (Marzocco’s Trophy). It is an international challenge between the different groups of “sbandieratori” (flag throwers) who perform in some specialities right in Piazza della Signoria. The competition field is found right in front of and facing to the statue object of restoration; which with that proud look it distinguishes it and it transmits unique and unrepeatable feelings for the ones in the hobby sector who are passionate about it. The award given to the winning team is exactly of the reproduction of the Donatello’s statue and because of this that’s why it is important to support its integrity for our community. The statue’s “pietra serena” (stone) is not in good conditions and lichens and mosses are the owners of the lion snout. However, we wrote up some reports and also asked to the Fine Arts Offices of Florence Council, rights holder of the statue and who released the authorizations, to proceed with the restoration and the installation of the construction site. Thanks to and with the help of logistics and cultural skills of P.R.I.M.A. Association – also operating in the area for common aims; we would like to give our contribute for the restoration of the work. Also considering the strong bond that joins the group of Bandierai degli Uffizi and the Donatello’s Marzocco statue – representative symbol; together with Red Lily in white field of the city of Florence. PLACE OF RESTORATION WORK: The copy of Donatello’s Marzocco statue is situated on the right hand-side of the tribune (Arengario) of Palazzo Vecchio in piazza della Signoria Florence, close to the Nettuno Fountain of Ammannati. It is followed on its left by Giuditta and Olofene statue still of Donatello. The restoration work will take place on site. The materials will not be removed and the personnel involved for the restoration will work supported by a special scaffolding installed around the structure to be restored. It will have a covered roof which is necessary to protect the repair works and the staff from rain and bad weather. The contribution requested will be used exclusively for the restoration activity of the statue and for its advertisement, disclosure and realisation of one or various specific events that make visible and usable the project to the greatest number of Florentines and foreigners, national and international people. The restoration primary aim of the Marzocco statue of Palazzo Vecchio, is to make more usable the cultural artistic heritage of the city to the people, citizens and tourists visiting Florence from all over the world. The following purpose is to express the appreciation by Bandierai degli Uffizi to the might symbol that the Florentine Republique chose to represent the free and independent state. The bond between the city, the Bandierai degli Uffizi and Marzocco – which is the symbol of popular power, is very strong. Therefore, the copy of Donatello’s Marzocco statue is the one that represents better this such strong bond. Another such important purpose is the preservation of works of art from the cultural point of view. Together with the PRIMA Association we undertook a path of cooperation for the spread and divulgation of cultural initiatives by the involvement of communication experts. The restoration since the construction of the site needs at least 90 calendar days in order to be concluded and made available for the inauguration day that we expect it would be on 1st May 2016.